Trenethick, formerly part of Coldrenick Estate, near Liskeard, Cornwall, has been farmed by the Carpenter family for 250 years. John Carpenter and his wife Amanda farm organically, and guests get the fruits of their labours every morning! We’ve stayed here a couple of times on our visits to Cornwall and it’s a gorgeous, traditional farmhouse. We stayed the first time in Samson and the second time in Old Billy. We stayed for two nights 26/27 March and had a relaxed and enjoyable stay at Trenethick Farmhouse. 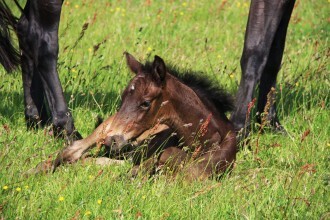 This year sees two pretty filly foals on our farm. Kaja May (Kaja is Cornish for Daisy) and Lottie. For three days in September the little town of Looe in South East Cornwall gets hit with big music, manic entertainment and a smattering of culture for good measure.